What is it about David Bowie that attracts you to him? Is it his music? His fashion? His individualism? The night before going to see the special screening film on the David Bowie exhibition titled David Bowie is, I thought about my own experiences of the artist. Growing up in the ’80s, at the height of his popularity, I listened to his music and endlessly watched videos of him on MTV. I later learned to appreciate him as an artist and musician as I delved deeper into his influential music, albums, and performances. Yet as I thought about him, I realized that no matter how much I listened to his music, his words, looked at pictures of him, and watched his videos and movies – I could never quite identify a tangibility he seemed to possess. 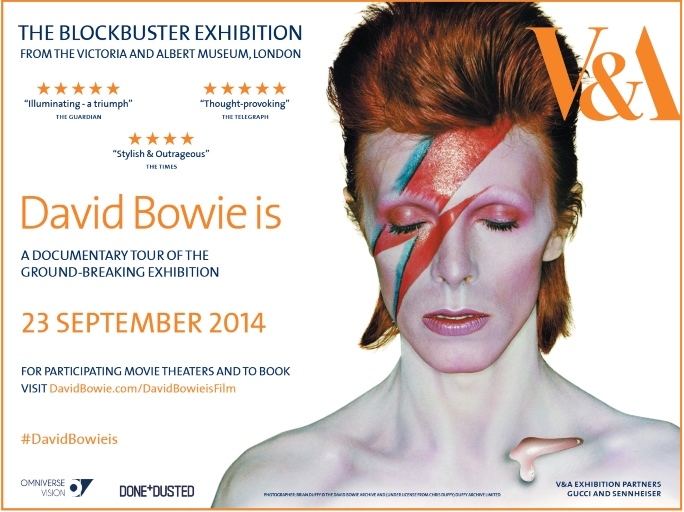 The exhibition, David Bowie is, is on an international tour. After finishing its stint at the Victoria & Albert (V&A) Museum in London, it is now at the Museum of Contemporary Art, Chicago. The documentary under the same name, directed by Hamish Hamilton, revealed the compelling exhibition on film. The exhibition is a celebration of David Bowie and his influence on multiple generations, pop culture, music, art, and style. The film gave a personalized and insightful tour of the exhibition designed just for the viewer. Guided and narrated by V&A curators Victoria Broackes and Geoffrey Marsh, it included video and documentary clips, music, interviews, and live presentations – producing an excitement and energy about the exhibition and tour. The film’s engaging narrative, its strategic use of music, live footage, and clips helped create intimacy and emotion and a sense of deeper connection to David Bowie. The viewer was led through the multifaceted and interactive exhibit – a spectrum of memorabilia, artifacts, music, video, cinema, costume, storyboards, photos, original handwritten lyrics, and artwork. The exhibit is composed in sequence of his life with each area presenting a time, style or theme, starting with his childhood, early bands, and influences such as Little Richard and avant-garde theatrical performer and teacher Lindsay Kemp. The extent of his creativity and work is portrayed in areas such as the “Space Oddity” room, which includes Bowie’s original artwork; a “Diamond Dogs” area that includes an original model of Hunger City; a roomful of original artwork; cinema and video sitting rooms; and the many fashionable costumes he has worn – including the one he wore during the famed 1972 Top of the Pops “Starman” performance. Emotional live presentations given by people who collaborated with or were influenced by David Bowie were captured on film: designer Kansai Yamamoto who designed many of Bowie’s costumes, including the ones for the Ziggy Stardust and Aladdin Sane tours; Jarvis Cocker from the band Pulp; Professor Iain R. Webb, a lifelong fan who kept scrapbooks of Bowie; and Sir Christopher Frayling, who talked about Bowie’s notable performances in cinema. Although all different stories and experiences, they all had one thing in common – they all experienced a special connection with Bowie, whose influence had affected their lives. The film portrayed the extent of the exhibition, which reflects the prominence of David Bowie as a musician, artist, and cultural icon. He has touched each of our lives in some way. That night, I was presented with the discovery that I’ve been looking in the wrong place for that tangible feeling I sought in Bowie: It wasn’t about how I felt about him, but how his impact, his music, his lyrics, and his style made me feel about myself. When asked about what attracts you to David Bowie, look within yourself. What has his influence helped bring about in you? A second screening of the film will be showing at the SIFF Cinema Uptown on Saturday, November 22, 2014. The film is a must-see that would only enhance a visit to the exhibition. If you can, visit the exhibition in person. It is now at the Museum of Contemporary Art in Chicago until January 4, 2015. Groninger Museum, Groningen, The Netherlands: December 15, 2015 – March 15, 2016. Written by: BBS on 10/14/2014. This entry was tagged david bowie is, michelle woods. Bookmark the permalink.